These sweets will ensure that no one eggs your house—unless you hoard them all to yourself, of course. Check out these ideas for DIY Halloween Treat Bags and a Halloween Candy Cookie Bars Recipe. 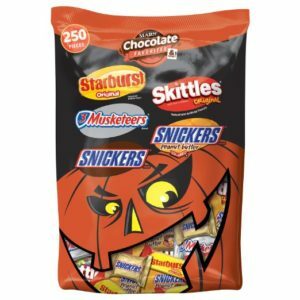 This assorted mix features fun-sized and minis-sized STARBURST, SKITTLES, 3 MUSKETEERS, SNICKERS Peanut Butter Squared and SNICKERS Chocolate Candy Bars. Fill up your Halloween candy bowl with Fun Size and Minis Size chocolate candy bars for handing out to trick-or-treaters. 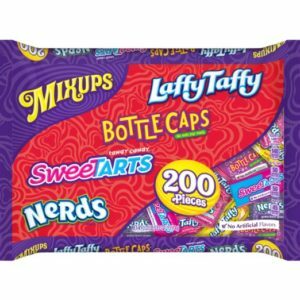 $9.94 (Buy Here)Each bag includes an awesome assortment of delicious Nestle candy, including Laffy Taffy, Bottle Caps, SweeTarts, and Nerds. 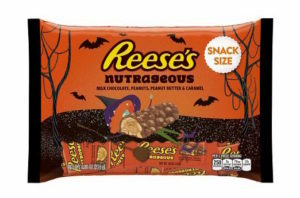 Individually wrapped pieces of Halloween candy. 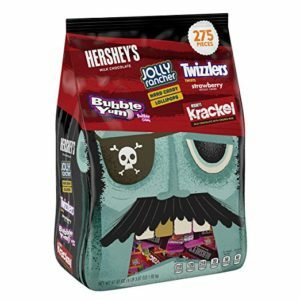 $22.15 (Buy Here)Assortment includes HERSHEY’S Snack Size Milk Chocolate Bars, TWIZZLERS Strawberry Twists, BUBBLE YUM Bubble Gum, JOLLY RANCHER Lollipops, JOLLY RANCHER Hard Candies, and KRACKEL Snack Size Chocolate Bars. 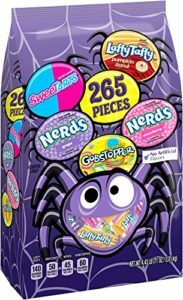 $17.52 (Buy Here)Each bag includes an awesome assortment of delicious Nestle candy, including SweeTarts, Nerds Grape, Nerds Strawberry, Laffy Taffy Caramel Apple, and Gobstopper.